**WARNING** IF THE SIGHT OF A DEAD ANIMAL THAT HAS BEEN KILLED FOR FOOD BOTHERS YOU, DO NOT PROCEED ANY FURTHER. 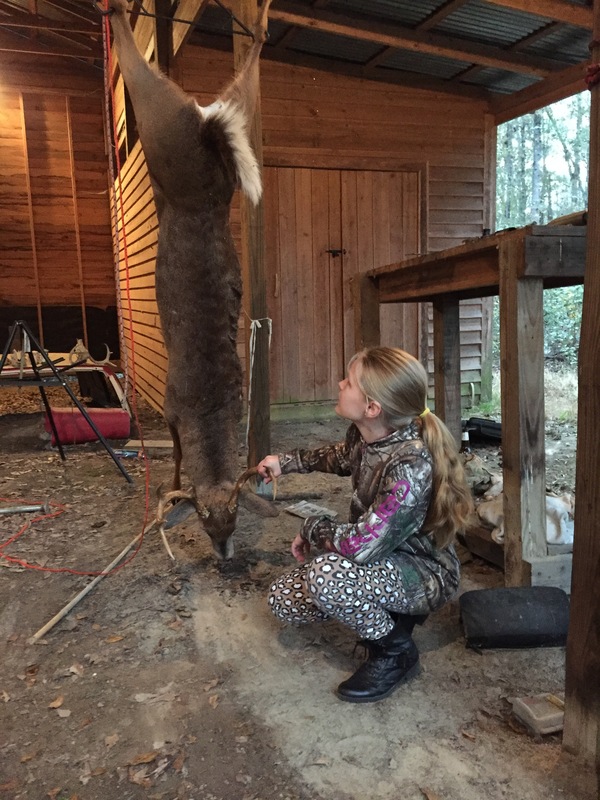 THROUGHOUT THIS POST, THERE ARE PICTURES OF A DEAD DEER AND A VERY HAPPY LITTLE HUNTRESS. Alison and Daniel in the blind. 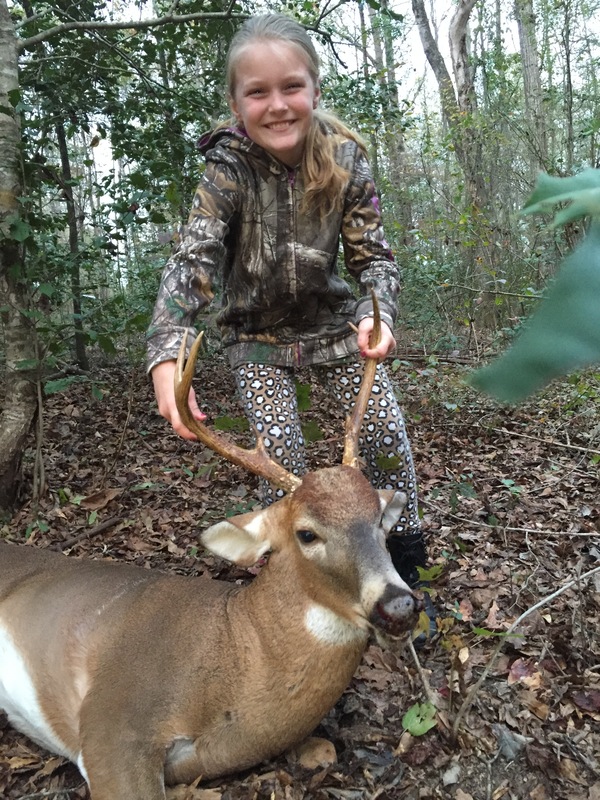 When my beautiful, blonde-haired, blue-eyed, animal-loving nine-year-old daughter informed me she wanted to go deer hunting, I didn’t believe her. But, I should have. She meant what she said and was persistent in trying to convince me she was ready. After two years of her pleading, Alison got her wish the day before Thanksgiving of 2015. I don’t sugar coat life for Alison, and discussing hunting was no different. 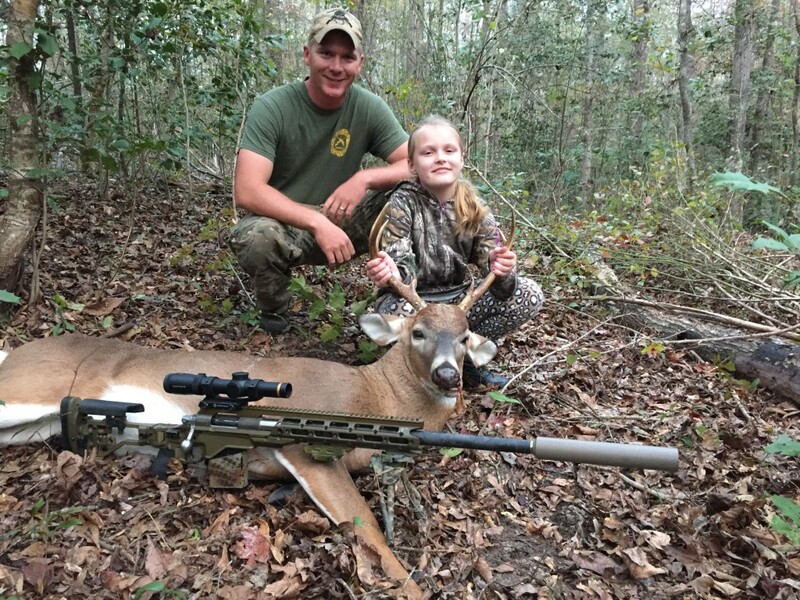 She quickly learned it would be her responsibility to make a good kill shot so the animal wouldn’t suffer. She would be the one pulling the trigger, taking the life. 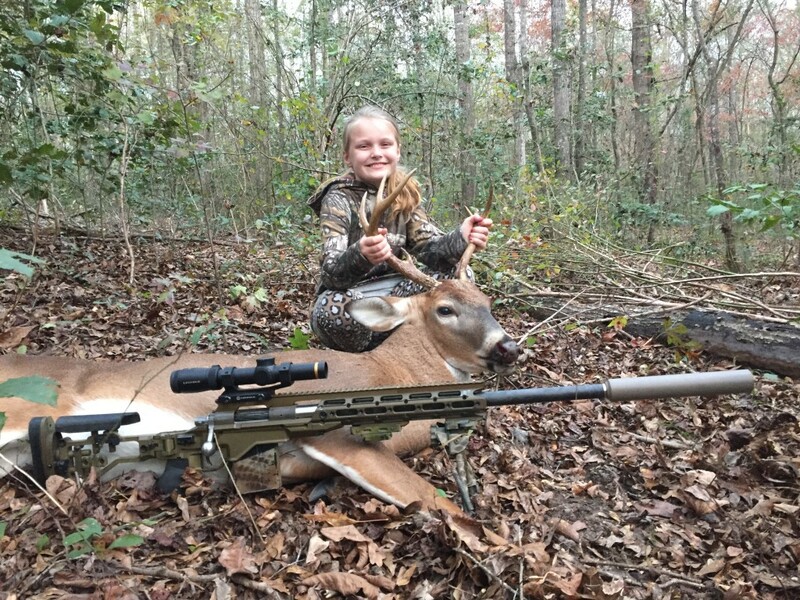 She would have to experience every detail after that shot: tracking, cleaning, cooking and finally the anticipated end result- the gratification of a field-to-fork meal. Tyler Payne teaching Alison what to look for when tracking. She’s excited about tracking, there’s some lung tissue! 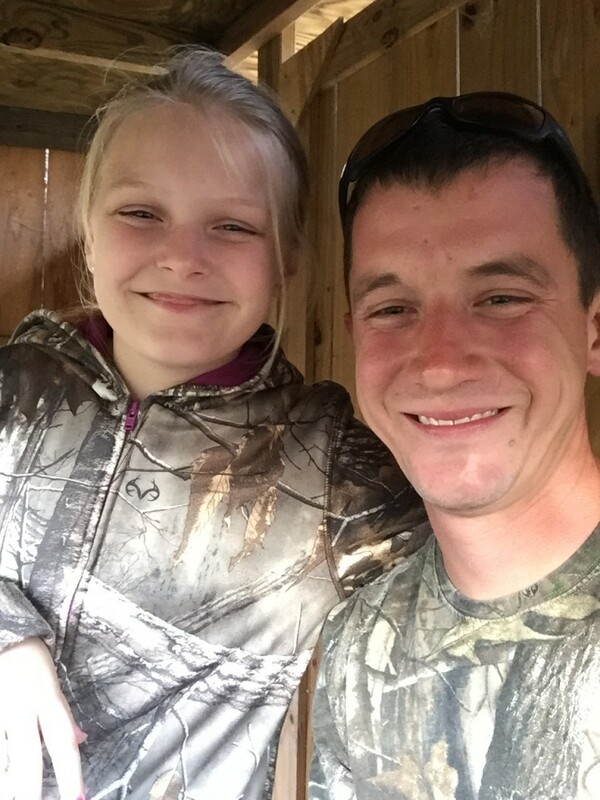 My husband, Daniel (Alison’s step-dad), prepped her for her first hunt. 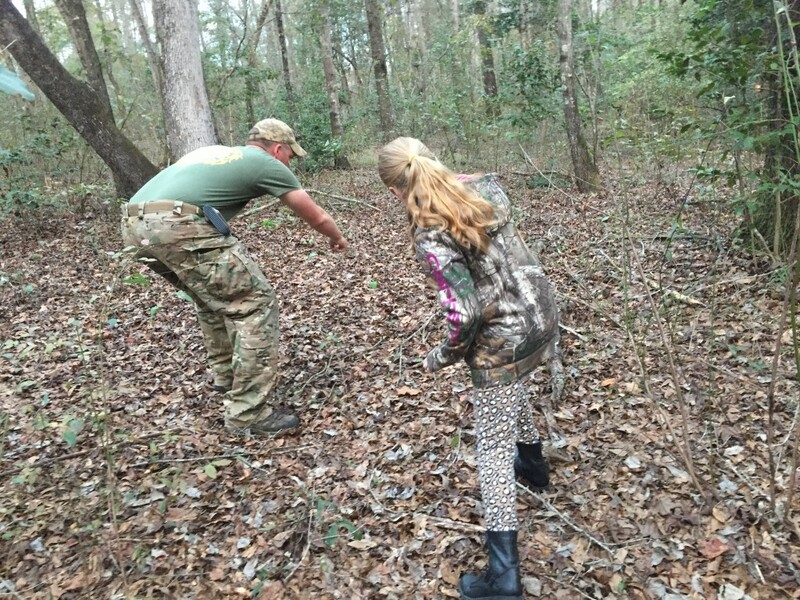 They practiced shooting positions, dry-fired the rifle, zeroed together, and discussed the anatomy of deer. Daniel tested her shooting ability to determine at what distance Alison could successfully shoot. Alison was consistently making hits on an 8 inch steel plate out to 200 yards from multiple shooting positions. She was confident behind the gun. I was stressed leading up to the hunt; this was a new kind of worry for me. Maybe I was the one who was not ready. Instant panic rushed through my body when my husband texted saying, “You are not going to believe this!! She got one.” I texted back with questions- no answer. I tried to call- no answer. Immediately, I was scared she would regret her decision. I worried she was crying and I couldn’t hug her. This is one of those defining moments in a child’s life; I hoped the moment she was living was a positive one. 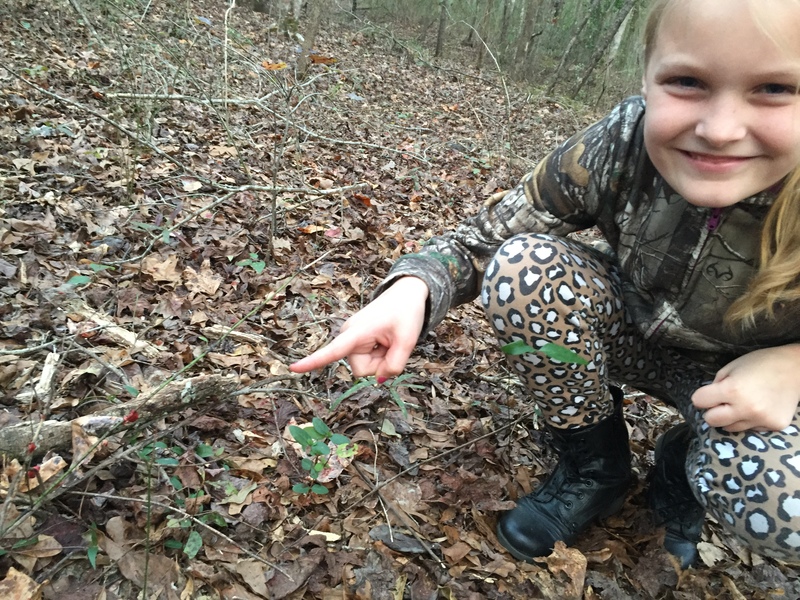 It didn’t go far, but she was thrilled to find it. Forty-nine minutes after that initial text, Alison called me with her story. “Hello? Momma, can you hear me?” As soon as I heard her voice, I knew she was okay. I could hear her smiling through the phone. She proceeded to tell me about how she “made a good shot, right through the heart.” She was beyond excited. She was proud; I was proud. 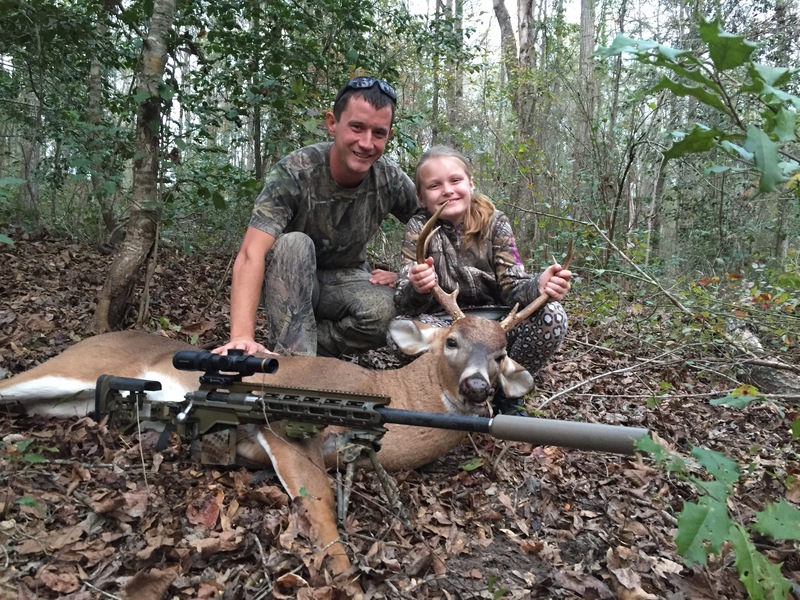 My little girl did exactly what she set out to do, and she has provided us with many meals thanks to her success. Her comprehension and accomplishment has given me a new outlook on what “my little girl” can do. Go forth and conquer, Alison. Big thanks to Tyler for letting Alison hunt on his land! Rifle used: The same unicorn gun I used for my first hunt. It’s a Surgeon action, with a PROOF Research barrel, chambered in 30 AS, in a Remington Lightweight RACS chassis, and a Leupold VX-R firedot scope. The deer: A 7-point buck that happened to turn broadside at a little over 50 yards away (lucky, right?!). Alison’s no newbie around firearms, she spends a lot of time on the range and got her first rifle when she was six years old.